Background: Synthesis, characterization and investigation of antibacterial activity of ten novel Schiff base derivatives of 4-formylbenzoic acid is presented. Their structures were determined using 1H and 13C NMR, EI(+)-MS and elemental analyses. 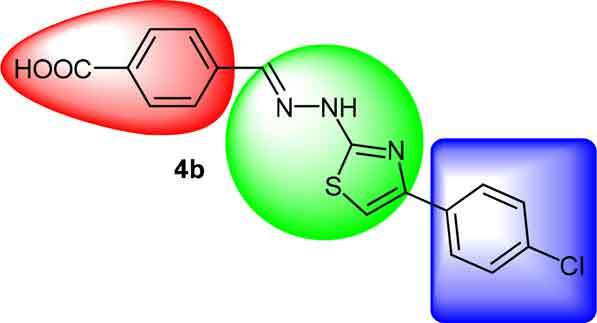 Additionally, DFT calculations of interaction energies in complexes of the novel drugs and DNA bases are carried out. Objective: Design and synthesis of thiazole derivatives with benzoic acid scaffold to obtain compounds with an improved antibacterial activity. Method: The examined compounds were screened in vitro for antibacterial activity using the broth microdilution method. Geometrical parameters of the investigated complexes were optimized within the Density Functional Theory (DFT) approximation using the B3LYP functional and the 6-311G** basis set. The docking simulations were performed using the FlexX docking module. Results: Among the derivatives, compound 4b showed very strong bacterial activity against staphylococci, MIC 1.95-3.91 µg/ml, micrococci, MIC 0.98 µg/ml, and Bacillus spp., MIC 7.81-15.62 µg/ml. The compounds 4c, 4d, 4e and 4j also showed high bioactivity against staphylococci, MIC 3.91-31.25 µg/ml, and micrococci, MIC 0.98-15.62 µg/ml. Interaction energy values for investigated guanine complexes are about 2 kcal/mol lower than for the corresponding cytosine complexes. Molecular docking studies of all compounds on the active sites of bacterial enzymes indicated gyrase B as possible target. Conclusion: To conclude, an efficient and economic method for the synthesis of thiazoles containing benzoic acid moiety has been developed. The results of antibacterial screenings reveal that some obtained compounds show high to very strong antibacterial activity. The DFT calculations showed that interaction of the obtained drugs with guanine is stronger than with cytosine. Molecular docking studies of all compounds on the active sites of bacterial enzymes indicated gyrase B as possible target. Benzoic acid, thiazole, nucleobase, antimicrobial drugs, molecular docking, hydrogen bonding, DFT study.